Photos by Chris Glover, no reproduction without permission. These photos are from the 1987 drama serial, Vanity Fair. 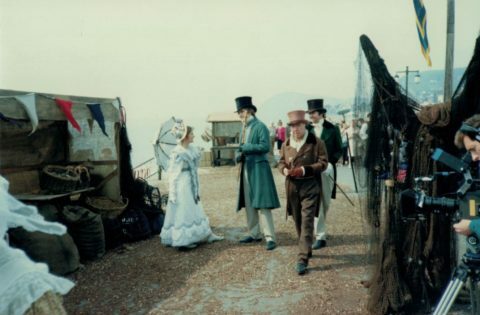 They were taken in Sidmouth, which was standing in for Brighton. In the second photo is ‘Amelia’ (Rebecca Saire) (L) talking to ‘Dobbin’ (Simon Dormandy). Chris’s wife Wendy Bradfield made this and other costumes for Rebecca.